The last two lines that DCD have put out were the first (and likely only) series of Batman: Battle for the Cowl and Series 5418 (oh wait, could it only be Series Five?) of Blackest Night. 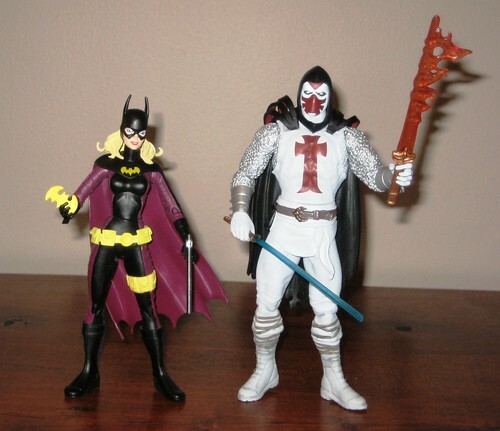 From Battle for the Cowl, I purchased Batgirl and Azrael. I'm a big fan of Stephanie Brown and am greatly enjoying her run as Batgirl, so this figure was pretty much a given me regardless of quality, but I'm certainly not disappointed by the product. For starters, this figure is actually in scale with some of the older DCD Batman family figures - with DCD's scale track record I was worried that Steph would be towering over her Bat-colleagues, but thankfully that's not the case here. This is a very nicely detailed figure, from the textures on her uniform to her belts (waist and thigh) to her hair, which has been crafted with a softer plastic that doesn't completely hinder her neck articulation. Paint is also top notch here, and her accessories are well done, although her little yellow batarang doesn't fit very snugly in her hand. hand, which is a minor quibble for what is otherwise a brilliant figure. From Blackest Night 5, I only bought Nekron. I have been staying away from the Black Lanterns (except for Aquaman, refer to above) but this is Nekron's first time in plastic and it's quite a premiere. There's some amazing detailing here, from Nekron's open torso and icky insides to his flowing cape. I'm a bit bothered by the chains around his neck as they're a bit big and block your view of his headsculpt more than necessary. 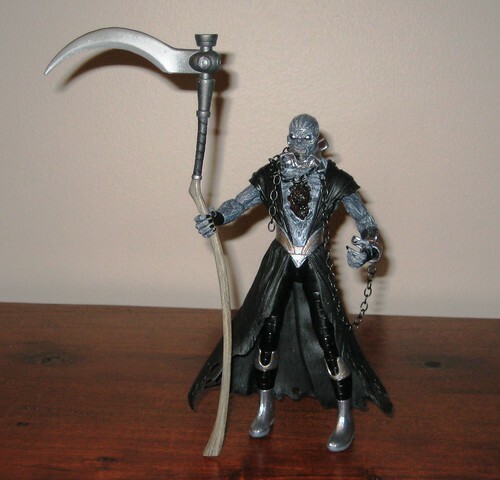 Nekron also comes with one of the most groovy accessories I've seen in awhile - his wooden handled scythe... thing. It's huge and interesting and... almost impossible to keep standing up, but that's okay - it's very good looking, and it's a wooden handled scythe... thing! Assuming Nekron wins the DCUC vote for the Wave 20 Collect and Connect figure (I voted for Shaggy Man for what it's worth) we'll likely have a bigger version of him in time, but it will be hard pressed to be as nicely detailed as this one. These aren't particularly newsworthy figures, but the reason I wanted to post about them was because to me they're all examples of what DC Direct could and should be. On it's best day, DCD beats DCUC for me hands down in terms of the ability to craft original bucks and use a high amount of detail, but Mattel has been washing the walls with DCD because of a pretty simple factor: an eclectic selection of characters including classic characters presented in a consistent style: which is all many of us ever wanted from DC Direct. I guess time will tell what the shake-ups at DC mean in terms of DCD's future output, but I'd just like to put in my vote for much more first time characters and classic lines and much less of the artist specific Superbat stuff we've been subjected to for way too long. You can see more pics at Facebook (Battle for the Cowl / Blackest Night), discuss this at the AFB Forum, and comment on this post to enter the September AFB Comment of the Month Contest. While I may not be a fan of spoilegirl, that figure is tops. Azreal needs his extreme 90s armor again IMHO. Nekron is neat zombie guy I guess. Does Azreal have a lightsaber? Truth be told, i don't really care for either of Batman figures, though i've never a big batfan to begin with. The Nekron on the other hand looks amazing! I love the chains on him, DCD did a great job there. I really hope he isn't chosen as a C&C just because we're getting a deluge of GL stuff right now. Like you, I'd much rather see a blockbuster or Shaggy man instead. Neat figures, but I think I'm done with DCD. I may not get a Steph or Azrael figure for a while but I can wait for DCUC to do it. Her eyes are painted nicely and I'm pleased with the little back hoslter to put the baton in. Stephanie hate the color of the costume but liking her in plastic finaly. Az never cared for him. Nekron Dcdirect nailed the evil version of death that black icky stuff is suppose to be his dark dead empty heart. plus the scythe is cool. Sideshow comes out in Force! Marvel Select's Latest are some of the Greatest! 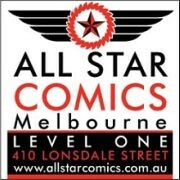 The AFB Comment of the Month Contest - September!